When the convention hall doors swing open today on the National Urban League's annual conference here, Hank Schwab will be there. Schwab's been there a long time. Coretta Scott King at a civil rights rally at Soldier Field in June of 1964. This year will be the 94-year-old Hyde Parker's 51st National Urban League conference. "It was 1958. I'd just moved into the new, integrated Lake Meadows housing development when I met Urban League President Bill Berry," Schwab says. "Berry lived on the 17th floor. I was on the 11th. We became friends. He took me under his wings, made me a member of the Urban League and put me on the board. He took me to all the national conferences." 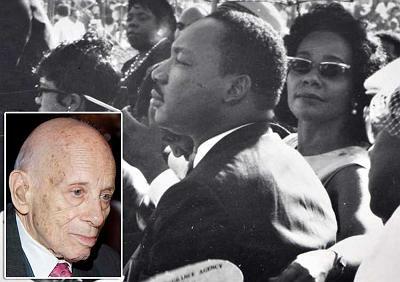 But Berry, the legendary civil rights activist who led the Chicago organization from 1956 to 1969, is only one of many African-American icons that Schwab, a Jewish immigrant and Holocaust survivor, has called friend over the years. His personal photo collection -- spanning decades -- is filled with images of him and the likes of Martin Luther King, Whitney Young, Julian Bond, Joe Louis, Dizzy Gillespie and other historical figures. Admittedly drawn into the African-American struggle for civil rights by accident, the still very vibrant Schwab has a colorful history. Born in Frankfort, Germany, he and his family at the onset of Nazi rule lived comfortably, running a family business. Then came Kristallnacht, the Nazi attack on Jewish people and their property in November 1938. The family business was destroyed, and Schwab and his father were among 25,000-plus Jews arrested and deported to concentration camps. "My number was 10052. I'll never forget that," says Schwab, imprisoned for five weeks at the Buchenwald camp recently toured by President Obama. "There were 10,000 prisoners lying on shelves. I didn't think I ever would get out." But it turned out an uncle in America, a banker, had filed for visas for Schwab's family as Germany was deteriorating. The visas came through while he and his father were in the camp, they were released, and emigrated to New York. "I believe that Jewish and African-American people had the same exact problem in the Holocaust and slavery," says Schwab, who found his way to Chicago as the civil rights movement was growing. "I was selling automobile policies when one day, several came back in the mail. The underwriting company told me, 'Sorry, but we don't take colored'," Schwab recalls. "I didn't know anything about discrimination until it touched me personally, and I was heartbroken." Schwab worked successfully to tear down racial barriers in his own firm, then met Berry and became a staunch activist in the movement. "There is no one in Chicago or the whole country who has been to 50 conferences but me. I've missed two since 1958," he says proudly. His photos and archival documents recently donated to the Chicago chapter -- including his program from the 1963 March on Washington and photos from the 1964 Civil Rights Rally at Soldier Field -- bear witness to pivotal moments in African-American history. This year, Schwab found himself close again to a pivotal moment he never thought he'd live to see. "It turned out President Obama is a personal friend of mine. He was my senator, and I have letters of his starting, 'Dear Hank,' and signed, 'Barack'," says Schwab. "What I can say is we've come a long way in civil rights in this country, but we still have a long way to go, and a black president does not change that." Comments on "94-year-old heading to National Urban League conference :: CHICAGO SUN-TIMES :: Metro & Tri-State"